Annual temperature: The historical time series of statewide annual temperatures in Colorado begins in 1895. Over the entire record, there has been an upward trend, which has resulted in temperatures in the early 21st century being about 2ºF warmer than temperatures 100 years ago. Despite this long-term rise however, the record continues to be largely dominated by annual and decadal-scale variability. The run of recent warm years comes on the heels of a period of falling temperatures that extended from the early 1940s through the early 1980s. Previous to then, temperatures warmed rapidly from the 1910s through the 1930s, long before high levels of industrial CO2 emissions. The highest annual average statewide temperature was observed in 1934. Figure 1. Annual statewide average temperature history for Colorado, 1895-2007 (available from the National Climatic Data Center, http://www.ncdc.noaa.gov/oa/climate/research/cag3/co.html). Seasonal temperatures: When Colorado annual temperatures are broken down into individual seasons, it can be seen that the observed warming has been, with the exception of fall, pretty evenly spread out across the year. Still, throughout all seasons, there is a large degree of interannual and interdecadal variability. Figure 2. Seasonal statewide average temperature history of Colorado (source: National Climatic Data Center, http://www.ncdc.noaa.gov/oa/climate/research/cag3/co.html). Precipitation: The precipitation history of Colorado indicates that the first part of the 20th century was wetter than the latter part, and thus exhibits an apparent overall slight downward trend. However, since 1950, the trend in precipitation is upwards indicating that a recovery is ongoing from the mid-20th century lows. Figure 3. Statewide average precipitation history of Colorado. The first few decades of the 20th century were a wetter period in Colorado than the most recent decades. However, there has been a rising trend from 1950 through 2007 (source: National Climatic Data Center, http://www.ncdc.noaa.gov/oa/climate/research/cag3/co.html). Drought: Since 1895, there has been a slight overall trend towards drier conditions across Colorado, likely a result of rising spring and summer temperatures coupled with a period of extreme wetness which dominated the early portions of the 20th century. However, since the end of the anomalous wet period, about 70 years ago, there has been no trend in moisture conditions when averaged across Colorado. According to records compiled by the National Climatic Data Center since 1895, statewide monthly average Palmer Drought Severity Index values—a standard measure of moisture conditions that takes into account both inputs from precipitation and losses from evaporation—show statistically significant downward trend (towards drying), although short-term variations are still quite evident. The string of dry years since the year 2000 acts together with the wet period in the earth 1900s to induce a negative trend in the drought record for Colorado. However, for the period from 1940-2007, there is no overall trend in moisture conditions across the state. Thus, is appears that the apparent 113-yr long downward trend is driven by early 20th century wet conditions, rather than by conditions in recent decades. Paleodrought: The droughts experienced during the past century in Colorado pale in comparison to the large droughts that have occurred there in the past. The character of past climates can be judged from analysis of climate-sensitive proxies such as tree-rings. Using precipitation information about past precipitation contained in tree rings, Dr. Edward Cook and colleagues have been able to reconstruct a summertime PDSI record for Colorado that extends back in time about 2000 years. Interestingly, the trend over the past two millennia has been towards generally wetter conditions. In fact, one of the wettest periods during the past 2,000 years in Colorado, and across the American West at large, was the wet period that occurred during the early 20th century. But rather than anomalously wet periods, the most remarkable characteristic of the reconstructed drought history of Colorado is the prolonged dry periods and “megadroughts” that occurred many time in past centuries—droughts that dwarfed any conditions experienced in recent memory. In fact, average conditions from about 0 AD to 700 AD were nearly as dry as the driest 20-yr periods during the 20th century. The paleo-climate record give us clear indication that droughts are a natural part of Colorado’s climate system and thus should not be used as an example of events that are caused by any type of anthropogenic climate change. Instead, they have been far worse in the past, long before any possible human influences. Wildfires: There is a clear link between dry conditions and the outbreak of wildfires across the western United States, including the state of Colorado. Figure 6 shows the co-occurrence of regional wildfire and dry conditions in the U.S. Northern Rockies for the past several hundred years. Notice that most regional wildfire (red triangles) occur when conditions are dry (PDSI is below zero, or summer precipitation is less than normal). Most widespread wildfire outbreaks occur during times of low moisture levels. And, as we have seen from our review of the paleodrought history of Colorado (Figure 5), periods of low moisture levels are not uncommon and have been occurring for more than 2000 years. A recent study created a paleo-reconstruction of wildfires across the western U.S. during the past 550 years using data collected on fire scars on trees (Kitzberger et al., 2007). In addition to finding the expected close occurrence between wildfires and droughts, the authors also found linkages between cycles of wildfire frequency and natural cycles of regional climate variability, both over the Pacific as well as the Atlantic Oceans. These natural cycles can go along way to explaining much of the variability in wildfire outbreaks. Throughout history, wildfire and drought have been linked together in Colorado and the western United States. And wildfires and drought are both influenced by natural oscillations in patterns of sea surface temperature and atmospheric circulation systems in the Atlantic and Pacific oceans. There have been times in the past that have been extensively drier and have been associated with a greater frequency of wildfires than anything that we have experienced in the past 100 years, prior to any widespread human impact on the composition of the atmosphere. This demonstrates that without any human alterations, the climate can change and vary in such a manner as to make both drought and wildfire a much more common occurrence in the Colorado than it is today. Heatwaves: The population of Colorado has become less sensitive to the impacts of excessive heat events over the course of the past 30-40 years. This is true in most major cities across the United States—a result of the increased availability and use of air-conditioning and the implementation of social programs aimed at caring for high-risk individuals—despite rising urban temperatures. Figure 7. Annual heat-related mortality rates (excess deaths per standard million population). Each histogram bar indicates a different decade (from left to right, 1970s, 1980s, 1990s). (Source: Davis et al., 2003b). A number of studies have shown that during the last several decades, the population in major U.S. cities has grown better adapted, and thus less sensitive, to the effects of excessive heat events (Davis et al., 2003ab). Each of the bars of the illustration above represents the annual number of heat-related deaths in 28 major cities across the United States. There should be three bars for each city, representing, from left to right, the decades of the 1970s, 1980s and 1990. For nearly all cities, including Denver, the number of heat-related deaths is declining (the bars are get smaller). This indicates that there has been a decrease in heat-related deaths over time—meaning that the population has become better adapted to heat waves. This adaptation is most likely a result of improvements in medical technology, access to air-conditioned homes, cars, and offices, increased public awareness of potentially dangerous weather situations, and proactive responses of municipalities during extreme weather events. Conversely, this also means that activist destruction of existing electricity generation capacity and prohibition of future capacity will link directly to preventable increased deaths. Malaria epidemics occurred as far north as Archangel, Russia, in the 1920s, and in the Netherlands. Malaria was common in most of the United States until the 1950s (Reiter, 1996). In the late 1800s, when the United States was colder than today, malaria was endemic east of the Rocky Mountains—a region stretching from the Gulf Coast all the way up into northern Minnesota, including the eastern half of Colorado. In 1878, 100,000 Americans were infected with malaria, and some 25,000 died. Malaria was eradicated from the United States in the 1950s not because of climate change (it was warmer in the 1950s than in the 1880s), but because of technological advances. Air-conditioning, the use of screen doors and windows, mosquito abatement spraying programs, the elimination of urban overpopulation brought about by the development of suburbs and automobile commuting were largely responsible for the decline in malaria (Reiter, 1996). The effect of technology is also clear from statistics on dengue fever outbreaks, another mosquito-borne disease. In 1995, a dengue pandemic hit the Caribbean and Mexico. More than 2,000 cases were reported in the Mexican border town of Reynosa. But in the town of Hidalgo, Texas, located just across the river, there were only seven reported cases (Reiter, 1996). This is not just an isolated example. Data collected over the past decade have shown a similarly large disparity between incidence of disease in northern Mexico and in the southwestern United States, though there is very little to no climate difference. Another “tropical” disease that is often wrongly linked to climate change is the West Nile Virus. The claim is often made that a warming climate is allowing the mosquitoes that carry West Nile Virus to spread into Colorado. This reasoning is incorrect. West Nile Virus, a mosquito-borne infection, was introduced to the United States through the port of New York in summer 1999. Since its introduction, it has spread rapidly, reaching the West Coast by 2002. Incidence has now been documented in every state as well as most provinces of Canada. This is not a sign that the U.S. and Canada are progressively warming. Rather, it is a sign that the existing environment is primed for the virus. In the infected territories, mean temperature has a range more than 40ºF. The virus can thrive from the tropics to the tundra of the Arctic – anywhere with a resident mosquito population. The already-resident mosquito populations of Colorado are appropriate hosts for the West Nile virus—as they are in every other state. 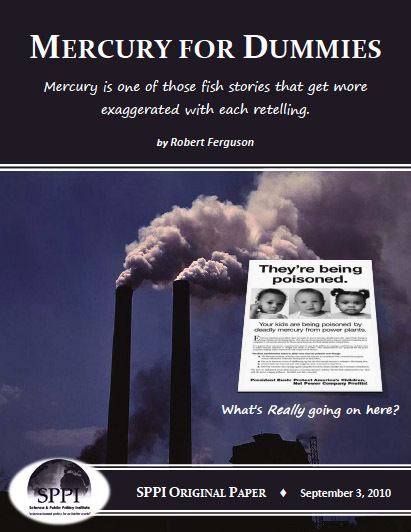 Globally, in 2003, humankind emitted 25,780 million metric tons of carbon dioxide (mmtCO2: EIA, 2007a), of which emissions from Colorado accounted for 89.7 mmtCO2, or only 0.35% (EIA, 2007b). The proportion of manmade CO2 emissions from Colorado will decrease over the 21st century as the rapid demand for power in developing countries such as China and India outpaces the growth of Colorado’s CO2 emissions (EIA, 2007b). During the past 5 years, global emissions of CO2 from human activity have increased at an average rate of 3.5%/yr (EIA, 2007a), meaning that the annual increase of anthropogenic global CO2 emissions is about 10 times greater than Colorado’s total emissions. Even a complete cessation of all CO2 emissions in Colorado will be undetectable globally. 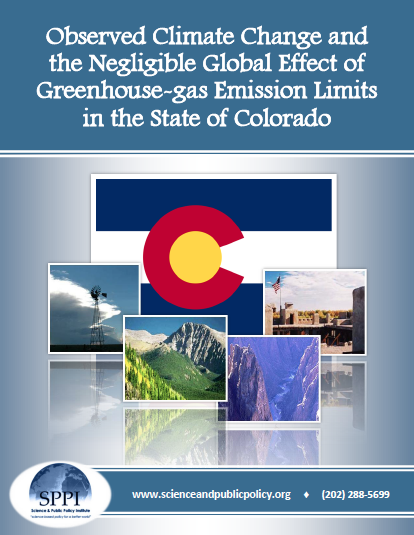 A fortiori, regulations prescribing a reduction, rather than a complete cessation, of Colorado’s CO2 emissions will have no effect on global climate. Wigley (1998) examined the climate impact of adherence to the emissions controls agreed under the Kyoto Protocol by participating nations, and found that, if all developed countries meet their commitments in 2010 and maintain them through 2100, with a mid-range sensitivity of surface temperature to changes in CO2, the amount of warming “saved” by the Kyoto Protocol would be 0.07°C by 2050 and 0.15°C by 2100. The global sea level rise “saved” would be 2.6 cm, or one inch. A complete cessation of CO2 emissions in Colorado is only a tiny fraction of the worldwide reductions assumed in Dr. Wigley’s global analysis, so its impact on future trends in global temperature and sea level will be only a minuscule fraction of the negligible effects calculated by Dr. Wigley. Note: Developed countries’ emissions, according to Wigley’s assumptions, do not change between 2025 and 2050: neither does total U.S or Colorado emissions. Table 3 shows the proportion of the total emissions reductions in Wigley’s (1998) case that would be contributed by a complete halt of all Colorado’s CO2 emissions (calculated as column 2 in Table 2 divided by column 3 in Table 2). A complete cessation of all anthropogenic emissions from Colorado will result in a global sea-level rise savings by the year 2100 of an estimated 0.04 cm, or two hundredths of an inch. Again, this value is climatically irrelevant. Even if the entire Western world were to close down its economies completely and revert to the Stone Age, without even the ability to light fires, the growth in emissions from China and India would replace our entire emissions in little more than a decade. The CO2 emissions “savings” from shutting down the entire state of Colorado would be replaced in the atmosphere in less than two months from just the increase of world emissions, to say nothing of natural flux. In this context, any cuts in emissions from Colorado would be extravagantly pointless. And what would be the potential costs to Colorado of federal legislative actions designed to cap greenhouse gas emissions? An analysis was recently completed by the Science Applications International Corporation (SAIC), under contract from the American Council for Capital Formation and the National Association of Manufacturers (ACCF and NAM), using the National Energy Modeling System (NEMS); the same model employed by the US Energy Information Agency to examine the economic impacts. To summarize, SAIC found that by the year 2020, average annual household income in Colorado would decline by $977 to $3167 and by the year 2030 the decline would increase to between $4019 and $7328. The state would stand to lose between 21,000 and 31,000 jobs by 2020 and between 57,000 and 76,000 jobs by 2030. At the same time gas prices could increase by over $5 a gallon by the year 2030 and the states’ Gross Domestic Product could decline by then by as much as $11.6 billion/yr. All this economic hardship and human suffering would come with absolutely no detectable impact on the course of future climate. This is the epitome of a scenario that is all pain and no gain, and a capital case of heroic lunacy. Kitzberger, T., et al., 2007. Contingent Pacific-Atlantic Ocean influence on multicentury wildfire synchrony over western North America. Proceedings of the National Academy of Sciences, 104, 543-548. Knight, D.E, and R.E. Davis, 2007. Climatology of tropical cyclone rainfall in the Southeastern United States, Physical Geography, 28, 126-147.